Tis the season and the adult beetles of the annual white grubs have emerged. Several callers have mentioned swarms of "millions" of beetles either emerging up out of the ground or swarming around the lights at the softball diamond or street corner. 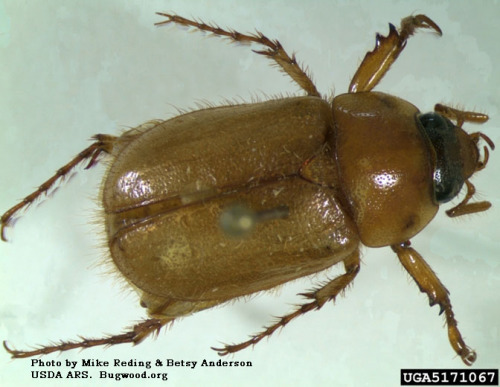 The majority of June beetles seen at this time throughout the state are the masked chafers. This small member of the Junebug (scarab) family is about one-half inch long and nearly as tall as it is wide. The color is straw-tan to light brown and there is a dark brown "mask" across the face. The second scarab beetle making its entrance for the summer is the Japanese beetle. It is slightly less than one-half inch long and has a metallic green thorax and coppery brown wing covers. There are five, small patches of short white hair on the back edge of the abdomen. Japanese beetles feed on the foliage, flowers and fruit on over 300 different kinds of plants. The masked chafer beetles do not significantly feed on plants. For nearly everyone, the white grubs that will be found damaging the lawn in September and October are the larvae of the masked chafer beetle. Japanese beetle grubs also feed on turfgrass roots, but are not yet a major turfgrass pest in most of the state (especially compared to the foliage and flower feeding destruction done by the adults in the 20 counties where they have been reported). Finding swarms of masked chafers now does not mean we should be killing beetles to protect the lawn from white grubs. It is important to remember that controlling the adult stage is a poor way to manage damaging pest larvae. There is no way to predict the future severity of white grub infestations. White grub populations and resulting turfgrass damage vary greatly from year to year and from place to place (even within the same yard) due to variation in weather, turfgrass vigor, soil conditions and other factors. Presence of large number of adults does not predict a "bad year" for grubs in the lawn, though unscrupulous lawn care companies will be making that fraudulent claim in an attempt to boost sales now that the adult beetles have emerged. Monitoring for the adult stage white grubs may indicate when grubs will be present, but not how many, nor exactly where, nor how much damage will occur. Emergence of the adults does mean that now is the time to decide if you are going to apply white grub preventive insecticide treatment or not. Links to this article are strongly encouraged, and this article may be republished without further permission if published as written and if credit is given to the author, Horticulture and Home Pest News, and Iowa State University Extension and Outreach. If this article is to be used in any other manner, permission from the author is required. This article was originally published on June 27, 2007. The information contained within may not be the most current and accurate depending on when it is accessed.